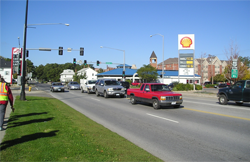 On the October 7 and 8, 2008, a road safety audit was conducted for the intersection of US 61/Harrison Street and West Locust Street in Davenport, Iowa. US 61/Harrison Street is a one-way street and a principal arterial route through Davenport, with three southbound lanes. Locust Street is a four-lane, two-way minor arterial running across the city from west to east. The last major improvement at this intersection was implemented approximately 20 years ago. The Iowa Department of Transportation requested a safety audit of this intersection in response to a high incidence of crashes at the location over the past several years, in view of the fact that no major improvements are anticipated for this intersection in the immediate future. The road safety audit team discussed current conditions at the intersection and reviewed the last seven years of crash data. The team also made daytime and nighttime field visits to the intersection to examine field conditions and observe traffic flow and crossing guard operations with younger pedestrians. After discussing key issues, the road safety audit team drew conclusions and suggested possible enforcement, engineering, public information, and educational strategies for mitigation.